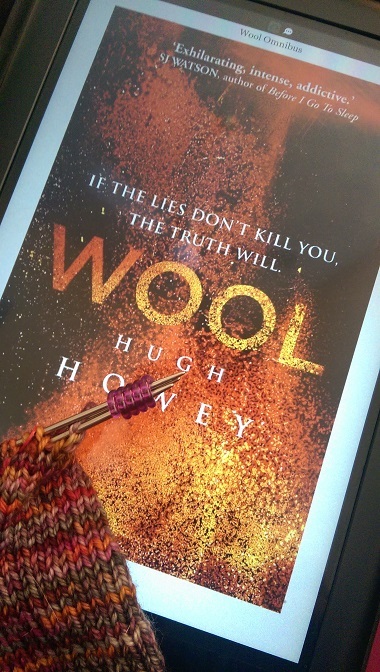 WOOL by Hugh Howey: That’s no spaceship… it’s a silo! I’m always on the hunt for a good science fiction novel. Like many other readers of the genre, I’ve run into my share of books set on multi-generational space ships traveling to distant stars. Some of these books are great, and some not so great. The problem, I think, is in creating a believable world within the boundaries of the ship while spinning the tale for the reader. Some authors get lost in the technical details of creating an independent, self-sustaining world and social culture within the ship and forget that they meant to tell us a story. Others remember the story but it is set in such a flimsy framework that it just doesn’t work. Every once in a while, however, I come across a book that strikes the right balance and is just great. Hello, Wool by Hugh Howey! This book isn’t set in a spaceship traveling to a distant star, but in a silo with 144 levels set deep into the earth. The silo is closed off and completely self-contained, and the few thousand residents have lived within it for hundreds of years. Everything on the surface of the planet is now dead, and the only chance for the survival of our species is to stay within the closed ecosystem of the silo until the earth recovers. Instead of traveling to a distant location, the residents of the silo are time travelers to a distant future and the journey began a long, long time ago. Here’s the deal: nothing is what it seems. It isn’t clear how the earth was destroyed, and the residents have no notion of any other world other than the one that they live in; their history was lost when computer servers were wiped during a past rebellion. There is a rigid social structure within the silo, and reproduction is carefully controlled by lottery while dead citizens are “recycled” in the gardens that grow food and produce oxygen. The lowest levels of the silo contain the critical power plant, the mines and the oil production facilities. The top levels contain the workers of the more “white collar” occupations. Gluing it all together are the major administrators: the mayor, the sheriff, and the head of the IT department. It is essential that the status quo is maintained. Dissension and rebellion are ruthlessly repressed, and it is absolutely forbidden to express a desire to go outside; to do so is a death sentence. Mr. Howey has created a fantastic immersive world within the silo; it is believable and hangs together extremely well. (It is so real that fans have been sending him schematics of the silo…) The story is also great; it begins with the death of the sheriff and a subsequent power struggle. As events unfold it quickly becomes apparent that the world in the silo isn’t what it should be; lies are being told, there are mysteries within mysteries, and the hunt for the truth is very dangerous. There are deaths, rebellions, a heavily guarded IT department, and so many secrets. Our girl, the newly recruited sheriff Juliette Nichols, is determined to get to the bottom of things. The trouble is, the truth may be even more dangerous than the lies. I loved this book! I was dragged in by the suspense and driven to understand what was going on. The characters are complex and well constructed; their stories were so real to me. I bought the next two books in the Silo series, Shift and Dust, and just kept reading. These books bring new characters into the story, and as the pages went by I started to understand how everything hung together. The resolution of the story and the integration of all the independent characters was a little weak at the end, but altogether the three books were great and I am on the hunt for another book by this author. Gosh, I hope they make a movie of this! If you are a science fiction fan that doesn’t necessarily need a space ship, this book series is for you. Author Midnight KnitterPosted on February 24, 2015 Categories Books, Science FictionTags Books, Dust, Hugh Howey, science fiction, Shift, Silo, Wool4 Comments on WOOL by Hugh Howey: That’s no spaceship… it’s a silo! When I used to work in a medical research lab one of my co-workers described what we did as mastering the art of serendipitous phenomenology. I think that he meant that we (hoped to be) alert, observant, curious and reflective about events around us. Big discoveries can occur from chance observations if one pays attention; one of the famous ones is Alexander Fleming’s discovery of penicillin. Another of my coworkers discovered an important immune system inhibitor (which led to a patent and eventually a drug. How cool is that?) Of course, there aren’t any big scientific discoveries in my life right now, but I have had a run of fun occurrences lately. It’s been making me think about serendipity, and that perhaps one of the secrets of finding joy in every day living is in mastering the art of serendipitous phenomenology. I went into a strange Starbucks Sunday on an impulse while picking up Chinese takeout. 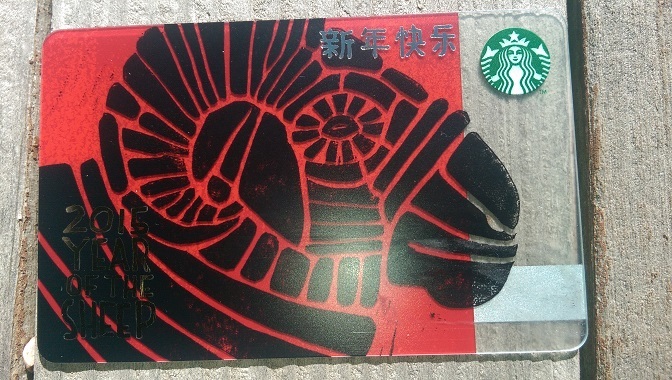 I needed a new Starbuck’s card as I had just lost mine. Look at what I found!! The hard-to-read text on the left says, “Year of the Sheep”. I was in a slump this weekend because I had just finished a good book. I forced myself to start reading the next book on my list, and it’s a science fiction with the title of WOOL!! It’s a really good book, too. How much fun is that? Serenity 20 sock yarn by Zen Yarn Garden. The colorway is Jewel. 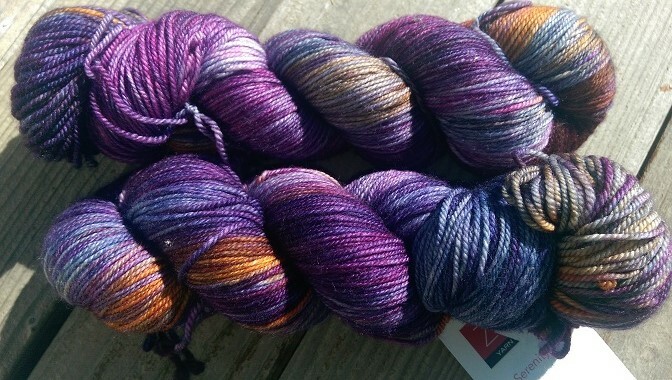 I was already contemplating serendipity when I arrived at my favorite local yarn store yesterday. I had a hazy notion that I wanted to get a cashmere blend yarn that would look nice with grey to make another Hitchhiker (by Martina Behm). Going through the sock yarns with a friend a skein suddenly fell out of its cubby and landed on the floor at my feet. “Well, there’s your yarn”, said my friend. There it was indeed! This yarn is 20% cashmere. The color is perfect for me and my new grey sweater. After going through all the yarn we could not find one that was a better fit. Hey, who am I to argue with the universe? This yarn is clearly destined to become a Hitchhiker. The answer to Life, the Universe and Everything. Obviously I needed to buy this yarn. See what I did there? Even though this yarn was expensive I was able to absolutely justify buying it with my smoking post-Christmas credit card. And that is the Art of Serendipitous Phenomenology, my friends. I am a child of the 50’s. I had a happy childhood, loved school, and really, really liked science. My standout memories of my elementary years are these: we made a paper machè cow in 2nd grade, the sunset is red because that color light is bent by the Earth’s atmosphere more than the others, Russia launched Sputnik, John Glenn orbited the Earth, chocolate comes from cocoa beans, and the Golden Age of Greece was only 50 years. What a hodgepodge of memories! As a child I knew absolutely that America was the best nation on Earth, and that I was living in a new Golden Age. In my mind, always, the Golden Age was linked to spaceflight. I also knew that the Golden Age of America would probably end within my lifetime. I have lived through amazing times. I watched the moon landing, abandoned my slide rule in favor of calculators, learned to write programs and use computers, watched the arrival of the Internet, and now own a cell phone that is actually a powerful computer beyond anything I dreamed of as a child. The world of biology has transformed in an equally powerful way as understandings about DNA and cells created an explosion of biotechnology that affects our food supply, medical options, and quality of life. Energy use and production has changed, human population has exploded, and diseases that I never heard of before have emerged. Polio is almost gone, Ebola is here. Climate change is upon us, and the geopolitical climate is transforming at the same time. The Golden Age of Greece was only 50 years. What we have today will not continue forever. This is one of the central premises of the book Coming Home by Jack McDevitt. In the book the society that we live in now eventually crashed, entered a Dark Time, and much was lost; the time when man first began to enter space is known in the future as the Golden Age. Thousands of years have gone by, humanity is spread over many distant planets, and the bits and pieces from our time are now worth money. Because of the intervening Dark Time, books, art and other artifacts from our era are rare. Just imagine: a drone, a copy of Pride and Prejudice, the lamp on President Obama’s desk, and James Watson’s Nobel Prize medal all for sale! The antiquities trade developed in the future is very lucrative for the right dealer, and objects from the time when people first left Earth and entered space are especially marketable. You know, a laptop that went to the moon, parts of the lunar orbiter, mission patches from the original astronauts, slices of moon rock, a coffee cup from the first mission beyond the asteroids. These things are now worth a bundle. The story focuses on Alex Benedict, a successful antiquities dealer who is part detective, part celebrity, and his associate Chase Kolpath, interstellar pilot and Girl Friday. When a client brings them an ancient electronic device found in a closet during a clean out, they quickly realize that they have found an important artifact from the Golden Age of Earth. The previous owner, the deceased Garnett Baylee, devoted his life to finding a mythical cache of rescued materials from ancient space museums. Did he succeed? Why the secrecy? Where are the rest of the materials? The hunt is on! Alex and Chase backtrack Baylee’s movements and contact his old associates in an effort to solve the mystery, locate the cache, and recovery these important historical relics. At the same time they are involved in a race against the clock to devise a rescue plan that will save the 2,600 passengers (including Alex’s Uncle Gabe) of an interstellar transport, the Capella, trapped in a space/time warp when they return briefly to sidereal time in the near future. In both efforts there is a race against the clock, conflicting opinions about the best course of action, elements of personal danger, and complications that can cause a devastating outcome. Action, suspense, family, danger, enormous profit! Read on, me hearties! Here’s the whole series of books in order from left to right, and reading up from the bottom of the stack. I’m still working on knitting while I read. I really liked Coming Home. It is a great balance of suspense, action, science and historical/social commentary all rolled into one reading extravaganza. This book is actually the latest in a series of seven books that follow the adventures of Alex and Chase, and concludes so well I’m wondering if this is the end of their story. I hope not. The dynamics between the two are great; kind of a little like Sherlock Holmes and Dr. Watson with some rogue planets, lost space expeditions, and artificial intelligences thrown into the mix. I mean, how can you have more fun than that, science geeks? This series invites meaningful speculation about some big questions: What does it mean to be human? Why do we seek extra-terrestrial life with the assumption that what we find will be a reflection of ourselves? Who does the past really belong to? If it was possible to create a digital interactive avatar of yourself, would you do that? How many flyers can one woman crash? Do rogue planets really exist? At what point do you conclude that your ship AI is “alive”? Final question: If this is the Golden Age, what, if anything, should be changed about how we think about the future? My son has been playing a game lately on his PS4 called Destiny. It has a minimal storyline; mostly the game seems to involve building weapons, armor, working in teams to complete missions, and blasting everything in sight. My favorite thing that I see him blasting is a tank that looks like a giant spider. See, there is biology even in space-themed shoot-em-ups. I do idly wonder about the storyline of this game. The premise is that a “Traveler” came to Earth with new technology that boosted the human condition. Following this event other aliens followed the Traveler to Earth, there were horrific battles, almost all the inhabitants of the Earth and its colonies on the other planets in the solar system were lost, and humans are now engaged in an endless war. Or maybe this is all wrong; the game scenario involves activating a long-dead person to participate as a “Guardian” in service to the “Traveler”. The player only knows what he/she is told. What is the truth? Where is the Destiny? Why is the game called that, anyway? All this has to do with a book that I read recently that continues to haunt me. In the book “The Forever Watch” by David Ramirez we meet Hana Dempsey and her fellow travelers on the spaceship Noah traveling to a distant planet called Canaan. The Earth has been lost; all that remains of mankind is the population of this ship. The journey is a long one; centuries have already passed and there are more to come before the journey is completed and mankind arrives at its new home. We quickly discover that life on the Noah is very different from the one that we know, and that things aren’t quite right. The Noah is enormous. There are entire cities and biomes contained within its hulls. Everything and everyone on the ship is subject to highly regulated conditions that are designed to maintain the ship, preserve the genetic diversity and survival of the crew, and ensure the success of the mission. Everyone has been tested, enhanced with cybernetic implants, and slotted into jobs that fit their physical, psychometric and mental abilities. There is extreme control of information and society is structured into a type of caste system. It is in this environment that Hana serves her mandatory Breeder Duty and awakens to find her child gone forever. Say, what? Children aren’t raised by their parents; that duty is assumed by specialists who raise the children of the ship. Hana struggles as she returns to her job as a city planner and reconnects with her friends after the lost months of her pregnancy. She enters into a relationship with Leon and joins him in an effort to solve the mysterious death of his friend and mentor. Here’s the problem of life on the ship: the crew only know what they are told. What is the truth? What should they believe? What actually did happen to the Earth? Are we really on a ship? Where did all of this technology come from? And what is up with all these mysterious and violent deaths? A lot of questions. I asked all of these and more while reading the book. This is an extremely intelligent book, and it took many twists and turns as the story unfolds and we discover the true history of the ship, the nature of the inhabitants, and the mission that they serve their lives fulfilling. Finally, at the end of the book, the title takes on meaning. Hana, suffering the loss of a child, gains much more at the end of her life. This is a good book, but it is also not a book for everyone. There are some serious challenges for the reader and flaws in the book. It is assumed that everyone understands homeostasis. Since I have failed to fully explain this concept to neighbors who have invested thousands of dollars into pH machines that are supposed to cure all illnesses, I suspect that it is a more elusive concept than we biology teachers want to believe. I know from personal experience that the alternation of generations in plants is beyond EVERYONE. At one point the author used the conjugative propagation of plasmids through bacterial populations as an analogy of something to do with computers. Seriously. Not everyone has a degree in microbial genetics. It would help readers of this book, however, if they do have a degree in computers. And what is it with all of the colors? I had to look up some of the colors in descriptive phrases just to figure out what they were. It was kind of fun, but only because I was reading on a NOOK. OK, enough with the venting. I feel much better. It is mostly because of these negative factors that I put off writing about this book for so long. Truthfully, this book was so good that it continued to nag at me for a long time after I finished reading it. Forget the technical problems; the plot was well conceived, the basic scenario convincing, and the twists and turns took me down paths and through doors that I didn’t expect. I look forward with longing for the next book by this author. Back to the game. I think that it is time for another mission. This is the fourth book in The Expanse series by James S. A. Corey which started with Leviathan Wakes, and then continued on with Caliban’s War and Abaddon’s Gate. I’ve learned to pay attention to the titles of these books, so even though I had some nebulous memory of Conquistadors searching through the wilderness and deserts for the lost (golden) city of Cibola, I did look it up. That’s right. The legend that lured Spanish Conquistador expeditions north into the unexplored southwestern region of the North American continent was one that involved seven fantastic cities of gold. Cibola. At the end of Abaddon’s Gate gates to many, many new worlds opened up for exploration, settlement and exploitation through rings left behind by a highly-advanced civilization that vanished before life really got going on Earth. This book picks up the story a couple of years after the events that closed Abaddon’s Gate in a smooth continuation of story line that builds on situations and characters that occurred in the previous books. Predictably, the first mission to conduct a scientific survey of a planet on the other side of a newly opened ring-gate arrives under the auspices of an energy corporation with mineral rights to the planet. Of course there are squatters, refugees from damaged Ganymede, already on the planet looking to defend their new home. Conflict is inevitable as each group strives to establish precedent and policy for all the new worlds to come. The solar system is a big place, and the centers of power are months away from this planet on the other side of a ring. Enter the Rocinante, already in the region of the ring-gates, sent to try to mediate an escalating crisis on the frontier. Of course things won’t go smoothly! The science is great and very well presented. One of my bosses once explained to me that science is actually a verb: you do it! This book does science instead of trying to present it to you. The biology especially is very heartwarming. The story continues to be told from different viewpoints. The different points of view are interwoven extremely well , and it is fun to experience the crew of the Rocinante through different eyes. Two of the new major players in the story are people we met in the previous books brought forward to this one in a manner that is entirely consistent with who they were and what they did before. I loved it! The characters in the story were reflective and evolved as time went on. Wow! While we are past the time of protomolecule-technology bioweapons, the fact that the ring-gate to the new world is an artifact from a lost civilization is skillfully embedded into the story. This new (alien) planet was exploited by vanished aliens in ways that can’t even be imagined yet. The ramifications of that may continue on into future books. Oh, joy! This is the most intelligent, action-packed and compelling book that I have read this year. I’m not sure if it is better than Caliban’s War, but it is very, very good. The Conquistadors discovered in their search for the lost cities of gold that things weren’t exactly what they thought they were. In “The Expanse” series the rush is on; what is on the other side of the rings in all those unexplored worlds remains to be seen. One thing is sure, the Rocinante will be busy and we are going to need Bobbie again! 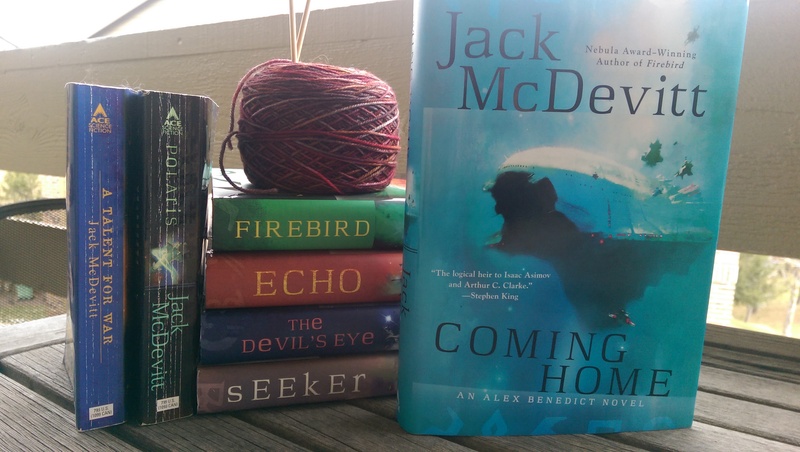 After I had raced through Leviathan Wakes and Caliban’s War I took a little breather, knitted some socks, and then took up the third book in The Expanse series by James S. A. Corey, Abaddon’s Gate. I really liked the first two books in this series, and had high, high expectations for this book. I could hardly wait to start it. Not too long after digging in I began to realize that something was wrong. Bobbie! Where was Bobbie (AKA Gunnery Sargent Roberta Draper of the Martian Marines)? That’s right. The story has moved along and the characters who joined the crew of the Rocinante in Caliban’s War have moved on with their lives. The Protomolecule on Venus has built and launched a huge Ring that is now located out beyond the settled Belt region of the solar system. It appears to be a gateway to another place. It is not clear what this means, or how it will impact humans, but Mars, Earth, and the Outer Planet Alliance (OPA) all scramble to send ships to observe and study the Ring. It is a power struggle. Each fleet is anxious to protect the interests of their home populations while preventing any other group from achieving an advantage. Additional ships carry advisory boards, film crews, political and religious leaders, and other important/interested parties. Everyone senses that this is a pivotal moment in human history, and there is intense maneuvering to gain importance, insure legacies, secure elections, or become the interpreter of events. Oh yeah, there are also some scientists who plan to study the Ring. Once again the story is told by characters experiencing events in different locations and circumstances. Holden is back on the Rocinante, and he is getting regular visits from “Miller” (from Leviathan Wakes), who appears to actually be an interface with the technology that controls the Ring. Clarissa Mao, connected to events in the previous books, hates Holden beyond reason and has created an intricate plan designed to disgrace and destroy him. Anna, a religious leader, gentle, resourceful, protective, and reflective, wonders what the Ring means. She struggles with the implications of impending contact with “something else”, and wants to support humanity during the time of adjustment. Bull, a no-nonsense head of security on the OPA ship, heads a mutiny to prevent an attack on the Ring. This is an action-packed book. The fight to control the OPA ship is so intense that even the crew of the Rocinante wished they could have Bobbie back. And yet, the tone of this book is somehow different from the other two in the series. There is less snappy dialogue on the Rocinante; there is more tragedy and a sense of desperation in this plot. People come unglued. This book is also about revenge, faith, sacrifice and redemption. I liked the book, and found it to be remarkable on several levels. I am really looking forward to the next book in the series, Cibola Burn.